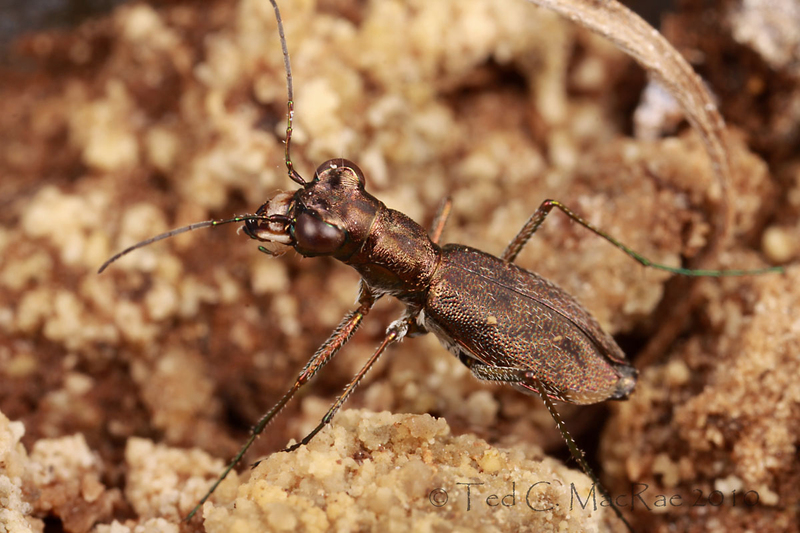 Regular readers of this blog might recognize this as the swift tiger beetle, Cylindera celeripes. This tiny, flightless beetle was once common in the central Great Plains; however, the species has experienced dramatic declines over the past century due to near complete destruction of its preferred prairie habitats. By the time I first became interested in this species a few years ago, the Flint Hills of Kansas were its last known stronghold. But that’s not what’s so special about this beetle. My colleague Chris Brown and I began looking for this species as part of a survey of Missouri tiger beetles. Although not previously known from the state, historical records from loess hilltop prairie habitats in southwestern Iowa suggested that it might be found in extreme northwestern Missouri at the southern terminus of the Loess Hills landform. Earlier searches in this part of the state by us and others had turned up empty; however, it was easy to imagine that the beetles had eluded detection due to their small size, cryptic resemblance to ants, and limited temporal occurrence. In an effort to understand more specifically its habitat preferences and gain a better search image for the species, we visited one of the historical Iowa localities in 2008 and succeeded in finding the species ourselves for the first time. Armed with this experience, Chris and I conducted another dedicated search for this species in Missouri during 2009, targeting the largest and highest quality loess hilltop prairie remnants remaining in the state. At last, our efforts were rewarded when we found beetles in several loess hilltop prairie remnants in Atchison and Holt Counties. Their numbers were not high at any of the sites, but the finds nevertheless represented a new state distribution for a species that has only seen contractions to its known range for many years now. A few weeks before finding the beetle in Missouri, I had an opportunity to visit Alabaster Caverns State Park in northwestern Oklahoma, where BugGuide contributor Charles Lewallen had photographed the species in 2003. I not only succeeded in finding the species at the original locality but determined also that its population there was quite robust. Indeed, on the same trip I discovered robust populations at several nearby localities, suggesting that the species occurrs commonly throughout the red clay/gypsum hills of northwestern Oklahoma. Further observations of the species in northwestern Oklahoma last month seem to confirm this. The beetle in these photographs comes from Alabaster Caverns, but that’s not what’s so special about it. What is so special about it is that it’s the first ever reared individual of this species! For those of you wondering why this is significant, until now the immature stages of this species have remained completely unknown. A few contemporary students of the group have tried to rear the species, but the adults are delicate and do not travel well – indeed, my own first attempt to rear the species when I found it in Iowa was not successful. 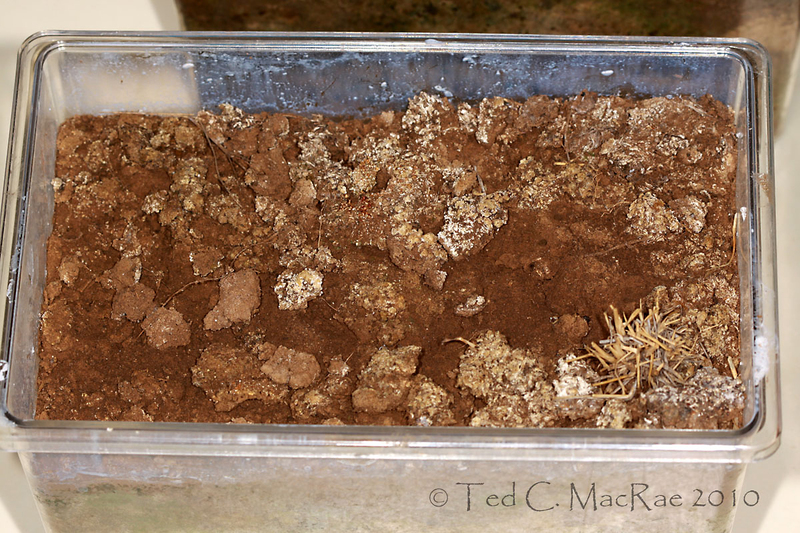 However, when I found the Alabaster Caverns population, I placed ~12 adults in a small terrarium into which I had placed a chunk of native soil and moistened with water. The adults survived well in this terrarium over several days of travel, and once back in the lab I kept them alive for several weeks by feeding them small caterpillars and fruit flies. When larval burrows began to appear I fed them periodically with very small caterpillars and rootworm larvae, inserting them into individual burrows and sealing the burrow entrance to prevent their escape. Additional prey larvae were inserted into burrow entrances as they were reopened, and the soil in the terrarium was moistened whenever its surface became quite dry. By late October, all of the burrows had become inactive, and I wasn’t sure if the larvae had died or were just overwintering. Nevertheless, I placed the terrarium in a cool (10°C) incubator, where it remained until this past March when I pulled it out of the incubator and returned it to warmer temperatures. Within days, larval burrows reappeared, and I knew then that I had a decent chance of rearing the species to adulthood. In early July, the beetle in these photographs emerged from its burrow – the first ever reared swift tiger beetle! Several more adults emerged during the following 2-3 weeks. While this rearing was in progress, I managed to find larvae of this species on a return trip to Alabaster Caverns last October. Both 2nd- and 3rd-instar larvae were collected and preserved to go along with the preserved 1st-instar larva that I had extracted from the rearing container when larvae first began to appear. While these preserved specimens are all that I need to complete a manuscript describing the larval instars, having reared the species completely from egg to adult as well will provide a most gratifying conclusion for that manuscript. This entry was posted in Cicindelidae, Coleoptera and tagged beetles, endangered species, entomology, Great Plains, insects, nature, Oklahoma, rearing, science, techniques, tiger beetles. Bookmark the permalink. 25 Responses to What’s so special about this beetle? Congratulations! That has got to be very satisfying. It will be nice to see an egg to adult photo essay when you have photographed all the stages. Thanks, Adrian – quite satisfying indeed. Wow..that’s great news. Congrats. Love the mandibles on these creatures! Thanks, Kurt. 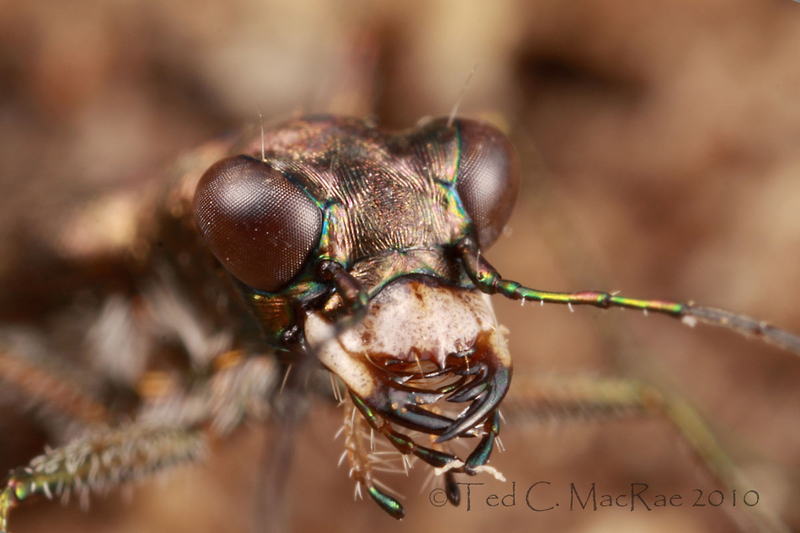 “Face-on” shots with tiger beetles are hard to resist. Amazing things are still being discovered! This is a handsome, copper-colored creature. There are literally millions of such stories waiting to be told. Great story. I could only imagine the feeling of triumph when the adult emerged! Triumph was exactly the feeling I had when I opened the container (yet again hoping to see an adult but expecting not to) and saw that little guy running around. Great job Ted and the kind of work a biologist should be doing. Pity the academic where hands-on science is all too much an academic concept and endless hours of meetings, grant writing, reviewing, supervision, whinging, politicking, and last and certainly least, teaching, conspire to keep one from ever doing something as trivial as unravelling the life history of a rare species. Thanks, Dave. While I’m not in academia, I run into the same thing on my job – the science is what I enjoy, but so much of my time gets eaten up by the distractions you mention above (replace “grant” writing with “budget” writing. Oh, and my “teaching” duties are far less onerous and more enjoyable, consisting of periodic “bug show-and-tells” at local elementary schools). Long ago I had to make a choice between pursuing beetle biosystematics as a profession or an avocation – sometimes I second guess my decision, other times (like this) convince me my choice was a wise one. Great work with the Swift Tiger Beetle. It’s great to learn new things and it’s always more satisfying to have that knowledge come through successes than through failures. Sometimes I’m overwhelmed by my failure derived knowledge. I’ve never worked with any animals, but I’ve studied many rare plant species by collecting seeds and raising the plants in a location where they can be observed daily. I always begin by raising them in a protected environment, such as you do by lab rearing your specimens. My next step is to create as best I can an outdoor site where I can observe how the plants grow and survive in a more natural setting. With a species such as your Swift Tiger Beetle, which comes from a very specialized habitat, do you think it possible that you could create a contained outdoor habitat in which the beetles could behave as they would on a natural site? I know it’s possible to manipulate soil texture to mimic that of a specific area. We can adjust pH, micro nutrients, and trace elements. There’s no problem building topography or artificially manipulating drainage patterns. Do we know enough about why a species is restricted to a specialized site to create additional suitable areas? It just seems to me that a logical next step following observation of the beetles in a terrarium would be to observe them daily in a more natural setting. Wouldn’t it be neat to step out the back door and hop into the tiger beetle pen to see how the residents are faring? Hi Steve – certainly an interesting project. What is still needed for this species though (and, indeed, virtually every endangered invertebrate species) is even more basic information about their life histories, habitat preferences, and especially trophic interactions. For example, I was successful at rearing the larvae by essentially “hand feeding” them by inserting prey into the burrow and trapping it there, but we still don’t know what they eat in the wild – this likely depends not only on what potential prey species are present but also the age of the tiger beetle larva. For habitat preference, we know that the species prefers native prairies and apparently does not adapt well to altered habitats, but why – is it a function of changed soil structure, plant communities, associated invertebrate assemblages, or (likely) an interaction of all of these? It may be possible to transfer a confined rearing container to a larger outdoor “pen,” but for my money I’d like to see efforts focused on understanding the habitat needs to allow management of existing refugial populations and possible re-introduction into restored habitats. I agree that the greatest need is an understanding of how an animal survives within its preferred habitat and what components of that habitat are critical for the animal’s survival. The fact that there are often so many apparently acceptable sites in which an animal doesn’t exist, suggests that we don’t know all of the components we should be evaluating. In order to fully understand the interactions between animal and habitat, we should be onsite observing that relationship. Unfortunately, there are not nearly enough qualified people available to accomplish these types of field studies. Add to that the rate at which some of this critical habitat is being lost and it just makes me worry that we’ll never have enough time to gather the essential information before habitat and species disappear. My question came about from wondering how to gather more information on species behavior when you can’t be on site with them. If you can’t go to the animal, bring the animal to you. It’s probably not easy or practical. It might be like a mini biosphere project. Thanks for your thoughts. They add a little more fuel to my ever curious mind, which tends to work somewhat abnormally due to 30 years of managing government programs and projects. I’m with you 100% here – especially regarding the lack of researchers and resources. The inability of this species to adapt to altered habitats – a hallmark for many species of tiger beetles – is particularly puzzling/intriguing. Riparian tiger beetles follow ephemeral, flood-dependent habitats up and down river corridors as they form and gradually succeed from open sand plains to bottomland forest, and upland species likewise colonize whatever disturbance-derived soil exposures can be found. This species, however, seems completely intolerant of any disturbance to or alteration of its native habitat. I visited several loess hilltop prairie remnants in northeast Missouri this year in an unsuccessful attempt to locate additional populations of the beetles – these sites were either smaller than those where we have found the beetle or have experienced significant impacts (mostly from overgrazing). I suspect the flightless nature of the species makes populations at given site especially vulnerable to localized extirpations. In the historical landscape, when remnants habitats were larger and interconnected in a more mosaic pattern, this had little impact since recolonization quickly occurred from adjacent areas. However, in today’s highly fragmented landscape, populations are smaller and completely isolated from adjacent populations. Understanding the dynamics here is difficult but key to figuring out how to save this species. Congrats !!! It’s enjoyable to see your scientific attempt come to fruition. Thank you Reynolds. The successes don’t come without frustrations, but it is satisfying when you finally work something out for the first time. Congratulations! After a too short trip to Willcox Playa last week – we saw many more species than we could catch because a strong wind kept blowing every beetle that flew up to safety across the water.- I’m really in love with the group. Your patient rearing efforts are admirable. Good luck with the publication! Congrats, Ted. Wonderful post, too. Love that metallic-bronze color! Thank you, Amber. Pretty little guys, indeed. Great comment & great link! I’m going to be looking much more carefully at the dirt from now on. What a delightful story – and the story in the link had me laughing hysterically. Thanks for sharing. I have managed to catch one of these little guys and took a couple of pictures wondering how to post them so you could see them maybe you could tell me what they are. Feel free to email the photos to me if you want. Or you can get a free account at one of the many web photo hosting sites and send me the link – Flickr is one of the more popular photo hosting sites that people use.